Brian Bethel is a respected veteran journalist and current columnist for the Abilene Reporter-News. In the ’90s, Brian wrote a blog piece detailing an experience that would soon come to be shared by many others. His story is unique in that it was the first, and it was told by someone with an eye for journalistic detail and absolutely nothing to gain (and a career to lose) by spinning such an implausible yarn. One evening as Brian sat parked outside the local movie theater, filling out a check for the night deposit next door, his drivers’ side was approached by a couple of children, no more than 10 or 12. Brian rolled down his window, expecting a request for money. Only one of the boys spoke, but even before any words came out of his mouth, Brian was gripped by fear. An irrational, heart-pounding fear that he couldn’t explain. Brian burned rubber all the way home and wrote about the experience later that night. 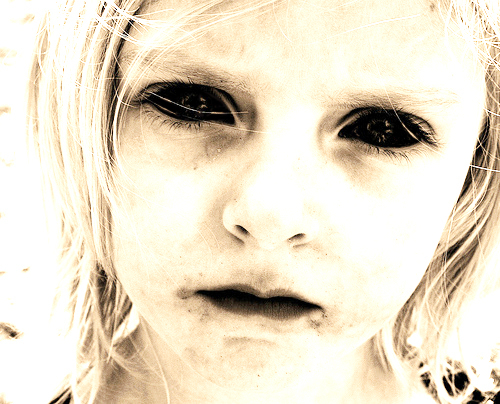 Apparently, he’s far from the only one—stories abound on the Web about black-eyed people, usually children but sometimes adults, with similar requests, who cause unexplained panic in all who encounter them. Perhaps it’s just those eyes, or the odd, somewhat alien nature of their speech—or the malevolent, predatory nature that those who encounter them can feel lurking just beneath the surface. No one has stuck around long enough to find out just who or what they really are. Perhaps you’ll find out some dark night, on some side street as you’re walking alone. Let us know, will you?